Microsoft Office 365 has a variety of game-changing applications that will help your business efficiency, but there is one that goes beyond the rest, Microsoft SharePoint. 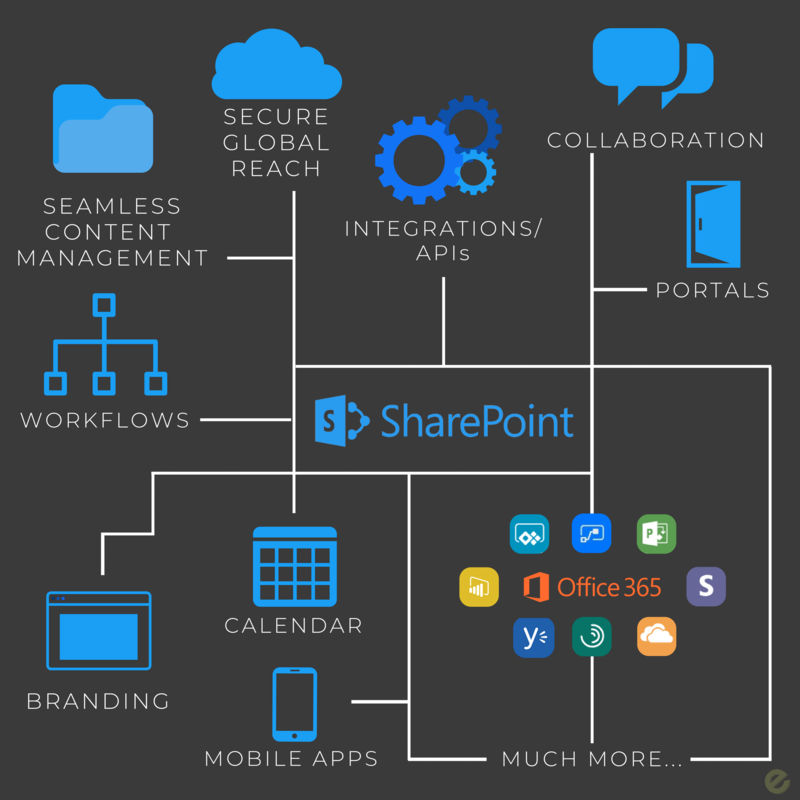 SharePoint is a platform where your organization can collaborate, access, store, and organize data from any device, anywhere around the world. Although, those functions are only the beginning of what Microsoft SharePoint offers. All you need is a web browser and internet connection. Utilizing SharePoint can increase your organization’s efficiency by cutting costs, optimizing business process workflows through developing business intelligence solutions, and creating a seamless and functional content management system. SharePoint Online is a cloud infrastructure hosted by Microsoft. SharePoint Server: Instead of being hosted by Microsoft, an organization can launch its own on-site server. Launching an on-site server opens up more feature like the ones mentioned above: business intelligence, enterprise content management, enterprise searches, and personal sites. Data stored in Microsoft SharePoint grew over 250% within the last year. Active users grew over 90% in the last year. Over 80% of Fortune 500 companies use SharePoint. How are companies using Microsoft SharePoint as a tool for Digital Transformation? Collaboration:Employees can collaborate in a centralized location. Team members can work together from anywhere. Through SharePoint, members can share documents, chat, video chat, or work on tasks together with simultaneous real-time editing. Teams can also create a restricted access site. This restricts access to the project to only approved team members. Convenience: Getting documents on demand is an extremely valuable feature. Companies can provide customers and vendors with their own secure portal. This will reduce the resource strain in the finance department by giving the customers and vendors 24/7 access to view and print invoices and purchase orders. Not only is this convenient for the clients, but also convenient for the employees. Employees can allocate their time to other tasks instead of having to answer calls and emails requesting invoice and current statuses. Along with this, employees from other departments can access these files, bypassing finance, and saving time. Companies have even used the client portals to distribute needed tax documents. One of the most useful features of SharePoint is Workflows. Workflows uses Business Logic to streamline the coordination of tasks such as project approval. It is defined as the automated movement of documents or items. Business logic is the instructions and parameters that govern the what happens to the document or item. It streamlines and automates certain tasks, saving time and energy for you to be focusing on other priorities. The figure below shows the actions in an Approval workflow. With eBiz being an Microsoft Gold Partner SharePoint Center of Excellence and Certified Microsoft Professionals, we lay down a solid foundation with a tailored plan to optimize your enterprise investment in SharePoint. Our SharePoint experts can help quickly and thoroughly identify the SharePoint Solution the best fits your needs. Click here for the SharePoint Solutions we offer! Want to get started? Contact us!